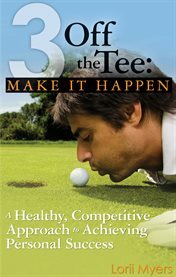 The item 3 off the tee: : make it happen : a healthy, competitive approach to achieving personal success, Lorii Myers, (ebook) represents a specific, individual, material embodiment of a distinct intellectual or artistic creation found in Charlotte Mecklenburg Library. At the age of twenty, Lorii Myers had a near-death experience when an allergic reaction to food additives caused her throat to swell to a point where she could no longer catch her breath. As her husband checked her into emergency, she lost consciousness and it took a shot of adrenaline to bring her around. Weeks later, she still had blister-like welts on her face, and during a follow-up appointment, she asked her doctor what would have happened if she hadn't made it to the hospital in time. He casually explained she could have slipped into a coma, but to Myers, the mother of a one-month-old baby, "It was the most significant thing in my world-survival," she says. At that very point, her perspective changed. She focused on what was important to her, learning how to embrace urgency and use it to her advantage. Immediately caught in what she refers to as "the make-it-happen moment," she launched a lifestyle that was geared toward the optimization of personal achievement. "One of my favorite mottos is ad astra per aspera," she says, "Latin for 'To the stars, through adversity.'" In her book, Make it Happen, the second in a series entitled 3 Off the Tee, she hopes to impart some of that spirit to her readers. Those who read her first book, Targeting Success, will already know Myers is a golf fanatic, and the golf analogies she uses in her books make them fun and sports-oriented. "I think constantly in terms of fairways and greens," she says. "In other words, keep me on the straight and narrow and I can't lose!" In any type of game, healthy competition prevails when you come out to play and play to win. A challenging game like golf requires mental and physical finesse and there is a constant incentive to improve your score, your abilities, and yourself. It reminds you of the value of being consistent, in control, and relentlessly resilient, and there is a powerful sense of urgency to stay focused, make decisions, and take your best shot. Despite inevitable distractions and hazards, as in life, you must keep your head in the game. "To be good at anything, you have to want it," says Myers. There may be times when you hit a point of transition and lust after change. Whether the change is initiated by external forces or self-induced, she advises her readers to get set in motion and to make a lunge toward whatever is missing from their lives. Myers wrote Make it Happen to help you when what you see as achievable brushes your life, when you figure out that the status quo no longer cuts it, and when you combine desire, determination, and knowledge and decide it's time to grab hold of your dreams and run with them. She wants you to be fully prepared to pull your dreams in from the fringe, get unstuck, feel the urgency, and step up. If you are confident that you have done the work, know what you want, and deserve that chance-why settle? Make It Happen promises a current, timely, and thought-provoking journey of self-discovery, and once you figure out what you want in life-expect nothing less. Stay the course!